There aren’t many things sadder than a jack-o-lantern a few days after Halloween. What was once a cute symbol of a fun fall holiday soon turns into a pitiful, molding vegetable taking up room on the front porch. Other than the one year we composted the pumpkin (only to find ourselves with hundreds of pumpkin seedlings in the garden the following spring), we usually just toss them in the trash. This year I wanted to try something a little more fun. I asked the kids if they would like to throw their pumpkins out our second floor window and see what happens. Let’s just say you don’t have to ask a kid twice to throw an object from great heights. The kids and their pumpkins were positioned at our bedroom window while I took video down on the ground. It might not last very long, but punkin chunkin from the second floor is fun. Our pumpkins were definitely broken, but still in large chunks. For the next round of fun the kids rolled the pumpkins, along with another pumpkin that didn’t make the jump, down to the wooded area in our backyard. I gave them each a baseball bat and let them go to town – Smashing Pumpkins for the under 5 foot crowd. It doesn’t seem like much, but this is exactly the kind of activity The Risky Kids is all about. Most of the time we’re telling kids to be careful, to restrain themselves, not to make a mess, don’t break anything. 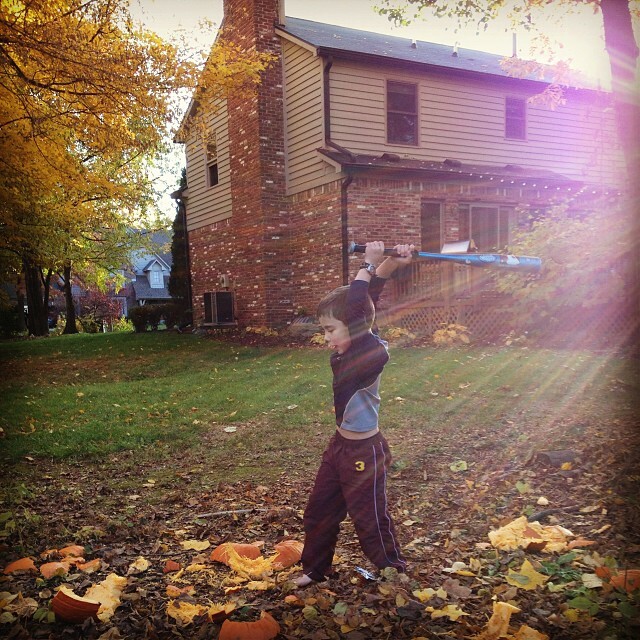 Punkin chunkin and smashing pumpkins frees them from the normal confines of daily life. They were downright gleeful. When all was said and done, I had satisfied kids, a cleaned-up porch, and some tasty treats ready for our resident squirrels and chipmunks to eat. If you still have carved pumpkins sitting sadly on your doorstep, try throwing them around before throwing them out!